While browsing in a used book section of a store, I found this 1906 edition printed in the second year of Morgan’s 39 year ministry at the Westminster Chapel in London (not to be confused with either the Abbey or the Cathedral). Morgan was followed there by D. Martyn Lloyd-Jones who retired in 1968. One never tires of reading words from men like G. Campbell Morgan. It seems that the concepts are so old and solid that they appear new to our own generation. 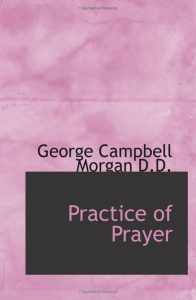 The reader has to put himself in the pew and realize the detail and length that Morgan’s sermons took in those days to appreciate this book.